A quick way to prepare ribs, without sacrificing flavor or tenderness! I have one other rib recipe on the blog and it is one of my favorites. It has always turned out well. 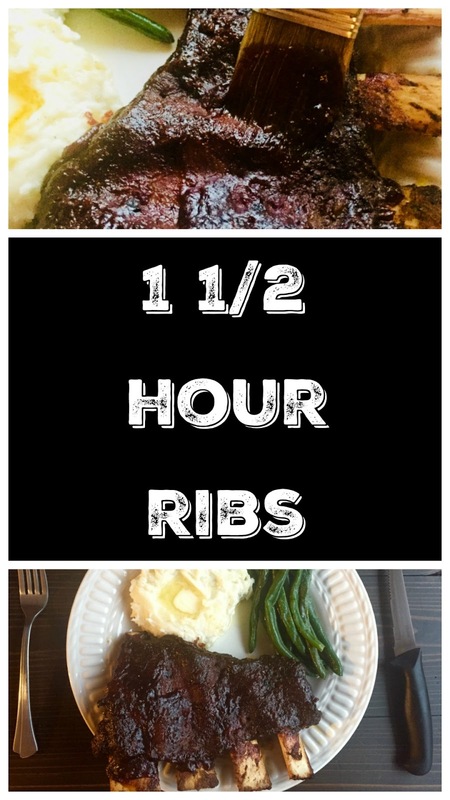 However, it takes 2 hours and 40 minutes to bake (not long in the rib world), but why take 2 hours and 40 minutes when you have a way to make them just as good in 1 1/2 hours? There is no reason! These ribs are just as tender and flavorful as longer cooked ribs, and all it really takes is a little extra heat in the oven. These ribs are super simple. Peel the membrane off the back of the ribs, rub 'em up, sauce them, foil them, bake, sauce again, and broil! It really isn't any more complicated than that. Don't get me wrong, grilled and smoked ribs are amazing, but I think it is often incorrectly thought that to have good ribs one must grill or smoke. Oven baked ribs can be just as tender and just as tasty. I don't know how many of you get close to dinner time, go look in the fridge and see there is almost nothing there, but that happens to us......often. It feels like one day our fridge is chock-full and the next we literally have nothing. Sometimes I really don't know where it all went. Such was the case this time when we realized basically all we had were some frozen ribs and we were starving. So, all I did was turn the heat up some and followed my favorite oven baking method and they turned out great, and exactly how I like them, charred and saucy on the outside, and juicy on the inside. Go buy yourself some ribs and enjoy them without having to wait the normal forever! Remove ribs, unfold tinfoil, sauce again, and broil on 500ºF for 5-10 mins and desired carmelizing has taken place, remove, and enjoy!